Workers compensation insurance & general liability insurance will be provided per your request. We are a licensed and insured contractor. We have liability and Workers’ compensation to protect our staff and our customers. We advise you to inspect and verify insurance coverage of any potential service provider before accepting any bids. If they don’t have full coverage you can be held liable for their medical bills. 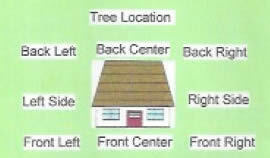 Please use the diagram below as a reference to indicate the location of the tree(s) in need of service. In most cases an estimator can simply drive by and leave you a written estimate, free of charge, as long as you give a clear description and there are no locked gates or dogs.